It is hard to overemphasise the depth of indoctrination in urban planning departments and urban design studios. Neighbourhoods are drawn by architects who are trained to produce neat plans at all costs — even if that means imposing geometries that oppress the people who will eventually live inside the plan. Even architects who would like to emancipate themselves from the bird’s eye view and conceive of spaces that focus on users’ experience — and there are many — have their hands tied. There are very strong mechanisms in place to prevent the emergence of complex urban forms. Incremental development is nearly impossible in the modern planning regime. Mixed-use is seen as complicated, live-work arrangements don’t seem to fit legal categories, and low-rise, high-density spaces mess up finances. The bureaucracy that oversees urban plans hates nothing more than ambiguity. For them, a plan can never be about two things at once. Space should either be public or private, residential or commercial, open or closed. At most, one can neatly stack functions on top of each other, but you can’t hybridise or worse, create new typologies. The exact opposite happens in neighbourhoods that develop outside planning norms, in spaces that are creatively re-appropriated by inhabitants. Functions are mixed and multiple. Places are readapted and modified over time. Such habitats are more complex to manage and nearly impossible to plan within existing regulatory frameworks. In fact, they are seen as the natural enemies of urban planning. According to anthropologist Marilyn Strathern, an ‘audit culture’ prevails in public administrations. Audits and balance sheets work best with binaries where everything, from living standards to environmental quality, is calculated in seemingly precise terms. Calculations need numbers with degrees of variation that eventually create maximum and minimum quotients, they thrive on polarities and value judgements. Auditing is inevitably accompanied by evaluation. Acts of evaluation come loaded with values. Auditing systems work insidiously, shaping institutional goals, educational agendas, and development objectives, and dictate urban planning through measuring resources and spaces in reductive ways. In urbanism, audit-based variables are best represented in the all-pervasive though simplistic binary that operates so casually these days — of cities as either formalised, planned and managed on the one hand, or informal, unplanned and ill-managed on the other. Quite simply, cities are either readable by auditing systems or not. This binary pushes all the living processes of what makes cities alive for everyone, especially newcomers, the young and capital-deprived, into the space of the informal — the unreadable, actually incalculable, spaces — those most difficult to audit. It leaches away agency and dynamism and creates a situation where some of the most exciting urban contexts with healthy local economies and great ecological quotients get classified as ‘informal’. And governing mechanisms are unleashed to bring them back into the audited or ‘formal’ fold. 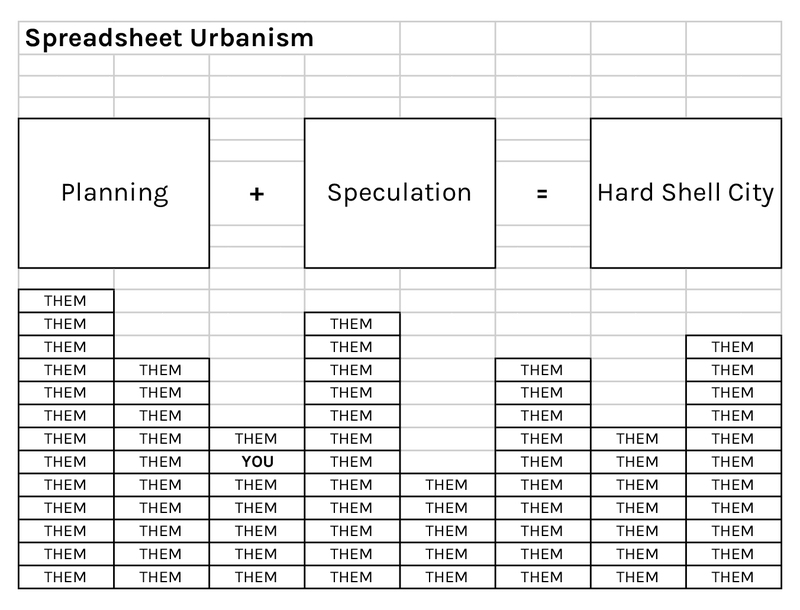 Sadly, smartly planned neighbourhoods and cities increasingly look like 3D Excel sheets: cubes, grids and boundaries, elevated into rectangular cubes on a vertical plane. Buildings are essentially boxes, stacked upon each other. They are easy to draw, audit and manage. They are even easier to fit into financial plans and investment portfolios. We live in the age of ‘spreadsheet urbanism’, the spatial expression of the merging of urban planning and real estate speculation. We live in the age of ‘spreadsheet urbanism’, the spatial expression of the merging of urban planning and real estate speculation. The result is a hard-shell city that forces users to adapt to urban structure, rather than the other way around. It is the polar opposite of what visionary urban planner Kevin Lynch had in mind when he imagined cities as “adaptive learning ecologies”. Does it have to be this way? Do cities and neighbourhoods have to become increasingly standardised and generic? The forces at work are very powerful. The state and the market are driving our cities in the same dull direction worldwide. Voters and consumers don’t get much of a say about the kinds of places they want to live in. We assume that what we see on hoardings is all we can aspire to. However, a new generation of planners seems willing to challenge this and imagine ways of putting people back at the centre of the plan. This involves conceiving new ways of financing development, lobbying to change or adapt regulation, overcoming the modernist dogma in architecture and urbanism, and, of course, planning along with the inhabitants. When the regulatory framework and financial plan shapes our cities. Which box do you live it?